Surgery is still considered a vital part of initial therapy for patients with advanced ovarian cancer, but the current debate is the timing of the procedure as well as the role of neoadjuvant chemotherapy, said Mario M. Leitao, Jr, MD, FACOG, FACS. 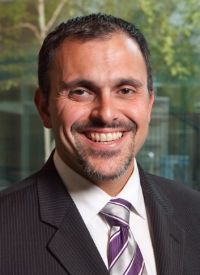 There are certain factors to take into consideration when deciding which patients should undergo upfront surgery or neoadjuvant chemotherapy, said Leitao, who is fellowship director, Gynecology Service, director, Minimal Access and Robotic Surgery Program, Department of Surgery at Memorial Sloan Kettering Cancer Center. For example, if an elderly patient has widespread metastatic disease, they would likely benefit from neoadjuvant chemotherapy with a platinum-based agent and paclitaxel. Occasionally, the regimen can include the antiangiogenic agent bevacizumab (Avastin), Leitao adds. In an interview at the 2019 OncLive® State of the Science Summit™ on Ovarian Cancer and Soft Tissue Sarcoma, Leitao highlighted the decision-making process for the placement of surgery in patients with newly diagnosed advanced ovarian cancer, as well as the use of hyperthermic intraperitoneal chemotherapy (HIPEC). OncLive®: How do you use patient selection to determine whether a patient should get upfront surgery or neoadjuvant chemotherapy? Leitao: At our institution, we still take a primary debulking approach. There is a flowchart that we kind of use in our head to decide who should receive surgery. There are a few criteria that would lead us to doing neoadjuvant chemotherapy first; it is usually in patients who are older—more than 70 years old—who have widespread metastatic disease and who have a less-than-optimal performance status or low albumin. If a patient meets these 3 criteria, those patients are primarily offered neoadjuvant chemotherapy first. If they don't meet those criteria, we will look at the disease distribution at the CT scan. There are some instances where we see that a complete cytoreduction is not possible on a CT scan. That is somewhat surgeon dependent. Also, we make sure the patient is medically fit for surgery. Therefore, for a patient who is sick or who has had a recent pulmonary embolism—someone who we don't think will be able undergo a full surgical resection—we will often offer them neoadjuvant chemotherapy first. Everyone else is a candidate for primary debulking. Interval debulking is essentially what would happen for someone who undergoes neoadjuvant chemotherapy. Surgery is still considered an important part of initial therapy for patients, although the debate is now about the timing of the surgery. Is it before the chemotherapy or after 3 cycles of chemotherapy? All patients will have some surgery at some point, but unfortunately, there are some patients who will never get to surgery either because they are too sick, too old, or they don't have a good response to initial therapy. What are you doing in terms of triaging patients? We don't use any sort of laparoscopic scoring system. We currently have a Memorial Sloan Kettering Cancer Center–specific scoring system based on prospective studies that we did in conjunction with The University of Texas MD Anderson Cancer Center, which looks at certain patient factors and key elements of a CT scan finding. We have radiologists who are just specialized in looking at these CT scans and we look at them ourselves. Certain elements are given a certain score, and then there is a score created for this using patient age, American Society of Anesthesiologists score, and a few CT scan features that we've found to be predictive of a complete cytoreduction.